With its tree-lined streets, historical buildings, fine restaurants, and charming shops, Kennett Square is truly a walking town to be enjoyed. Other attractions by foot include a modern YMCA, Bayard Taylor Memorial Library, and Anson B. Nixon Park that includes a lake, groomed trails, picnic pavilions, tennis, basketball and volleyball courts, and a discus golf course. 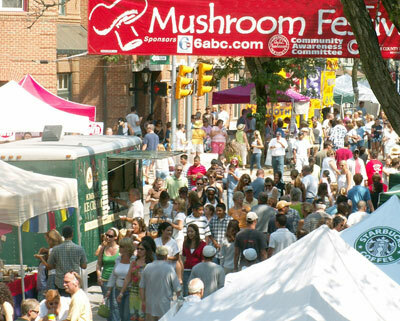 Come enjoy festivals weekends from early May until mid September when the annual Mushroom Festival occurs. First Friday Art Stroll - On the First Friday of the Month 6 p.m. - 9 p.m.
Memorial Day Parade - Last Monday in May starting at 10 a.m.
Horse-drawn Carriage Rides - Sundays in December - noon to 3 p.m.